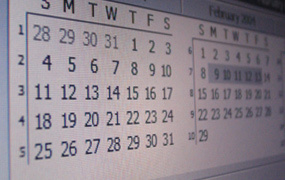 University calendars keep track of activities on campus. Read about the academic calendars, their functions, and who is responsible for their maintenance. Use the calendars below to keep track of important deadlines throughout the academic year. Academic and Administrative Calendar Menu: Link to academic calendars for past and future years to see start and end dates of the term, official UCSD holidays, and dates for finals weeks. Billing Due Dates: Make note of students' billing due dates. Enrollment and Registration Calendar: Find enrollment start dates and deadlines for enrolling in courses, dropping courses, changing grading options, paying registration fees, filing for part-time status, etc. Final Exam Schedule: Students can consult this calendar to avoid multiple finals on the same day as they plan their classes. Placement Examination Schedule: Find the dates, times, and locations of the math, language, and basic writing (formerly Subject A) exams. Summer Session: Find dates and deadlines for Summer Session.